Members of Hindu groups gathered on the Bulandshahr-Syana road and resorted to stone-pelting at the police personnel with a cow carcass. LUCKNOW: Two persons, including a police inspector and a 21-year-old villager, were killed in Bulandshahr district of western Uttar Pradesh on Monday, when violence broke out over an alleged incident of cow slaughter. 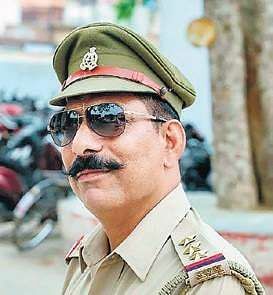 Inspector Subodh Kumar Singh died after being pelted with stones, and Sumit, a local, succumbed to a gunshot wound, said ADG (law and Order) Anand Kumar. Residents of three villages went on a rampage while protesting against illegal slaughterhouses and slaughtering of cows in the district, police sources said. The state government has set up probes by a Special Investigative Team and a magisterial probe, besides an inquiry by the Additional Director General, Intelligence, to ascertain the reasons for the violence and to identify those who opened fire during the chaos. According to ADG Meerut range Prashant Kumar, residents of Mahaw village spotted the carcass of a cow in the fields at 10:30 am on Monday. They reported it to the local police and demanded action against the culprits. Despite the assurance by the police, the villagers of three adjoining villages loaded the carcass on a trolley to take it to the Chingarwathi police outpost, and blocked main road. The protest took a violent turn when they pelted stones at policemen and the forces retaliated with lathi charge. Agitated protestors set the Chingarwathi police outpost on fire along with the vehicles, including a police van parked near it. They indulged in vandalism and firing as well.